The Condemnation of Christ and the Denial of Saint Peter, early 5th century. Museum of Antiquities Collection, Saskatchewan. Betrayal in Gethsemane, Fairstead, Essex, 13??. Medieval Wall Painting in the English Parish Church. The Betrayal of Christ, Masters of Dirc van Delf, 1405-1410. Getty Museum. The Denial of Saint Peter, Simon Bening, 1525. Getty Museum. Peter Denying Christ, Rembrandt, 1628. Peter Denying Christ, Georges de La Tour, 1651. Peter Denying Christ, Rembrandt, 1660. 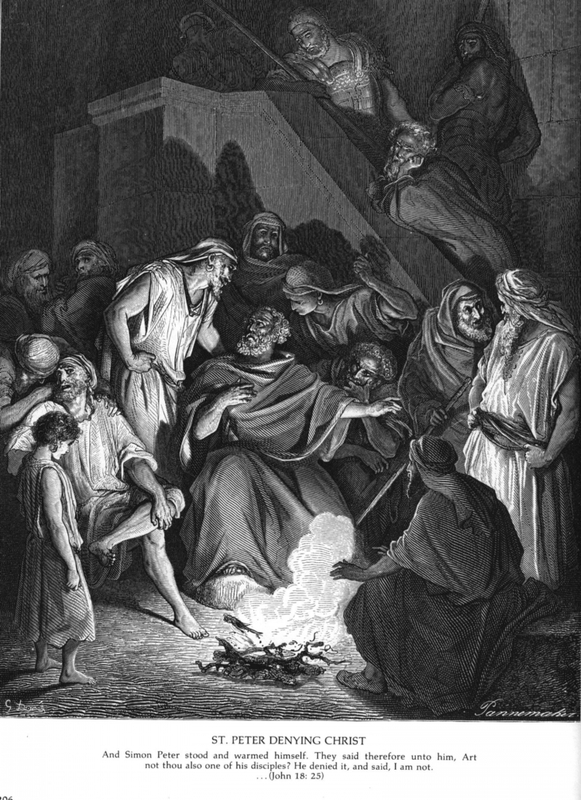 Peter's Denial, Gustav Dore, 1865. Felix Just's "Gospel of John" site. Peter's Betrayal, Carl Bloch, 1875, Hope Gallery. Judas Kiss, James B. Janknegt, 1992. Judas' Kiss, Bertrand Bahuet, 1995-96, fresco. Peter's Denial, Bertrand Bahuet, 1995-96, fresco. L'annonce de la trahison de Juda, Corinne Vonaesch, 2001. Peter Denies Jesus, African Mafa. The Kiss of Judas, African Mafa. Denial, Geoff Todd, Australia. Asian Christian Art Association. Betrayal 1, Geoff Todd, Australia. Asian Christian Art Association. Betrayal 2, Geoff Todd, Australia. Asian Christian Art Association. Denying the Hand of Jesus, Robin Jensen, "The Apostle Peter: Just a Simple Fisherman," contemporary. Scroll Right. Jesus Kissed by Judas, Chris Cook, contemporary.